Our team of VCU legends competing in this year’s “The Basketball Tournament” just got geared up with the unveiling of our team uniforms. The TBT designs logos and uniforms for all 64 teams competing in the event and this is what they came up with with a little bit of guidance from our group. 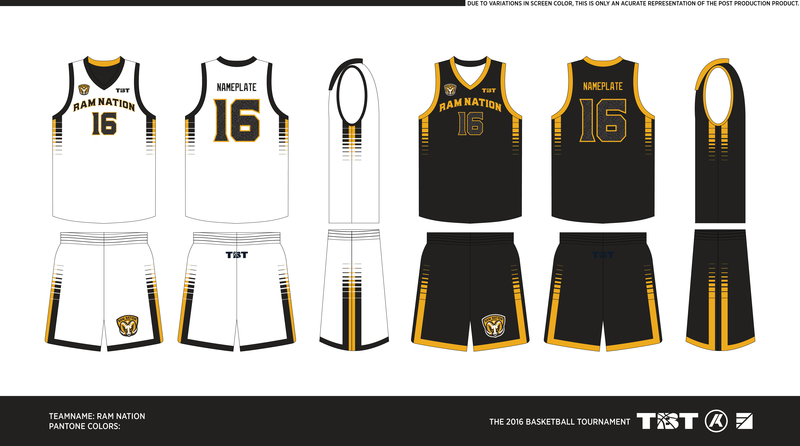 Team Ram Nation replica jerseys and t-shirts are available through the TBT’s website at www.the-basketball-tournament.myshopify.com. Jerseys go for $60 with team tees available at $25. Team Ram Nation will be competing out of the South Region, starting with game-one in Charlotte, NC on July 9. A full tournament bracket and schedule will be released by the TBT’s organizers on July 1. This will be VCU’s first year competing in the open-entry five-on-five tournament. The field includes a number of other alumni teams including groups from Davidson, Kentucky, Memphis, La Salle, Temple, Villanova, Kansas State, Gonzaga, Air Force, Utah and Colorado. Team Ram Nation consists of VCU legends Joey Rodriguez (player/coach), Jamie Skeen, Bradford Burgess, Brandon Rozzell, Darius Theus, Michael Anderson, B.A. Walker, Jesse Pellot-Rosa, Larry Sanders and VMI grad turned NBA vet (and Prince George, VA native) Reggie Williams. VCU fan Alex Hidalgo joins the roster to represent the fans while Eric Maynor joins as the team booster.